Tamarind is a tree originating from Africa, but over the years it managed to spread throughout much of Asia over India. The fruits of this tree are sweet-sour and they are used both raw and thermally-treated. When the seedless fruits are soaked in warm water, we get hot dark-colored liquid, an inevitable ingredient of Indian curry, and this is usually one of the main species of Indonesian and Thai cuisine. This sauce is used for marinating tofu before frying. 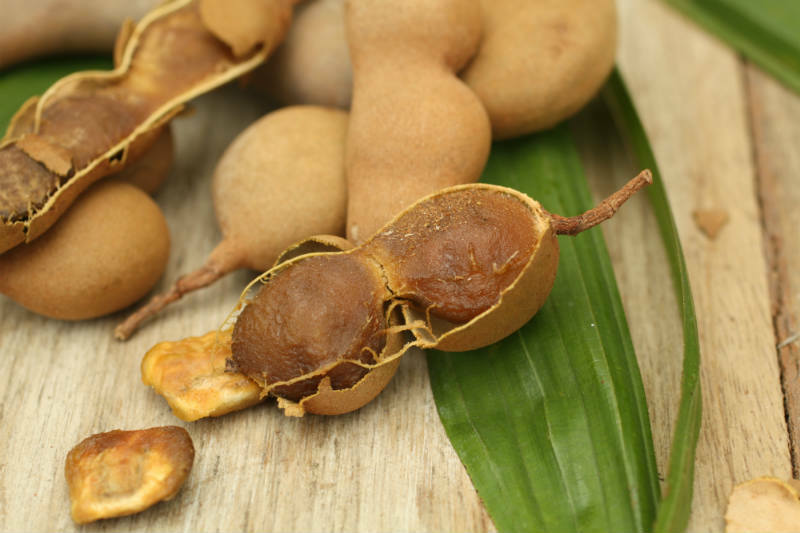 Tamarind fruits are packed with many nutrients and many people use it because of its healing properties. 1. It is a fruit used in Ayurvedic medicine in cases of digestion problems, gastric problems and for the protection of the cardiovascular system. 2. Eating tamarind comes with many health benefits because it serves as febrifuge, cathartic, refrigerant and antiseptic. 3. People also use this fruit as a natural laxative. Only two tablespoons of these pulps before you go to bed will improve the sluggishness of your bowels. 4. In addition, you can also use the leaves in your tea in order to reduce the symptoms caused by malaria fever. 5. Bilious disorders are occurrences where tamarind can be very helpful too. This is an acidic fruit which means that it stimulates the bile and the rest of the juices found on our body. 6. Tamarind keeps the cholesterol levels on a normal level and support the proper functioning of the heart. 7. Decoction of the leaves of this fruit is helpful in cases of ulcers and jaundice. 8. In cases of sore throat, simply gargle water mixed with the pulp. You will be amazed by the results. 9. Using a mixture of tamarind decoction and water can help children dealing with stomach worms. 10. It is packed with vitamin C which means it protects the system from Vitamin C deficiency. 11. Tamarind can also help with inflammations of the skin. 12. If you are trying to produce natural eye drops don’t forget to use tamarind seeds in them because they are very beneficial for cases dry eye syndrome. 13. Tamarind flower juice is often used for healing piles. 14. It is rich in antioxidants. This makes tamarind useful in fighting cancer. 15. The fruit has been used as a blood purifier since ancient times. 16. It can help you fight off cellulite. Mix one tsp of lemon juice with two spoons of tamarinds extract, one tsp of sugar and ½ tsp of baking soda. This remedy is applied externally on the affected area. Use a brush and massage the area in order to scrub the mixture. 17. This tasty fruit can also help people prevent hair loss and promote hair growth. In lukewarm water soak one tamarind for about 10 minutes. Extract its liquid and apply it to your hair and scalp in circular motions. Soak a towel in warm water (remove the extra water by squeezing it). Place this towel on your hair. Rinse the mixture after 30 minutes. 18. It is rich in vitamins and minerals and these substances are very important for the process of red cell production. 19. Tamarind paste is very useful for people suffering from diabetes. You can use it together with other herbs that provide benefits for diabetics, like jamun. The pulp of tamarind lowers glucose levels. 20. The same paste can be used externally on areas affected by swelling. In addition, this paste helps people dealing with arthritis.